The Satipatthana Sutta is an important discourse in the Pali Canon1. 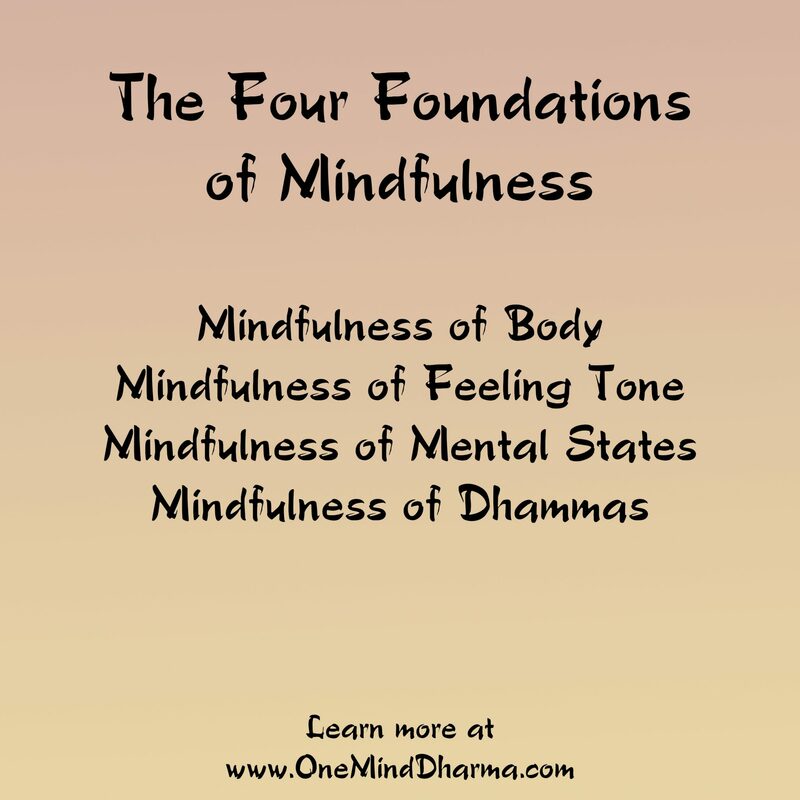 Often translated as “The Four Foundations of Mindfulness,” the Satipatthana Sutta contains the Buddha’s instructions on establishing mindfulness. Before going into the sutta and it’s teachings, there are a few things we must understand. First, we will take a look at what the word “mindfulness” really means. When people think of mindfulness, they tend to think of simply being present. As Sally Armstrong says, “If mindfulness is just being present, then a dog is basically enlightened.” Nothing against dogs, but mindfulness is more than simply being present. As the Buddhist monk and scholar Thanissaro Bhikkhu points out, the Pali word sati, which we translate as mindfulness, can actually be more appropriately translated as “remembering.2” It isn’t bare attention. When we are mindful of the body, we are remembering the body. We also may remember what is skillful and what is not, what leads to suffering and what leads to liberation, or the impermanent nature of experience. These are all things we can remember, or be mindful of. The point here is that sati is not just being present with what is occurring, but returning to it and evaluating it. Mindfulness has a reflective quality to it. The term Satipatthana is often translated as Foundations of Mindfulness. The Buddhist monk and scholar Bhikkhu Anālayo (who completed his Ph.D. thesis on the Satipatthana Sutta later publishing it as the book Satipatthana – The Direct Path to Realization) discusses the origin of this word. He, along with Thanissaro Bhikkhu, translate the term to mean “to attend to with mindfulness” or more simply, “establishing mindfulness.” These translations can be helpful for us to understand that this important sutta instructs us how to attend to experience with mindfulness, not just build a foundation for practice. To learn more about the suttas, visit our page at https://oneminddharma.com/buddhist-suttas/. The final point that I think should be made is that the satipatthana is believed by many scholars and monks to be a direct path to realization (as can be seen by the title of Anālayo’s book. Some believe that this means that this practice is the only way to realization, some believe it is the easiest or shortest, and some believe this means it is simply the most direct or shortest. Whatever the true meaning of the use of the term “the direct path” is, it’s obvious that this is a very important practice. In my opinion and experience, it is a teaching with which we should all familiarize ourselves. One of the points of satipatthana practice is to familiarize ourselves with the Three Marks of Existence: impermanence, suffering, and non-self. If you are interested in reading the English translation of the sutta, you may find a link at the bottom of this page. Furthermore, there are guided meditations at the bottom along with other resources. The First Foundation of Mindfulness is mindfulness of the body. This foundation is broken up into six sections: mindfulness of the breath, mindfulness of posture, clear comprehension, mindfulness of the reality of the body, mindfulness of the elements, and the cemetery contemplations. The body is always with us in this life. We can return to it over and over, investigating the nature of reality through the body. The first piece in the section on mindfulness of the body is mindfulness of the breath. The Buddha instructs us to know when we are inhaling, to know when we are exhaling, to know when the breath is long, and to know when the breath is short. It’s also suggested to experience the whole body as we breath. This practice is an essential Buddhist practice, and is one of the most commonly practiced forms of meditation. We bring our attention to the breath, noticing the subtleties. Each inhale and exhale becomes important as we gain in curiosity. The breath is always with us. As such, this practice can be done anywhere at any time. The second part of mindfulness of body is bringing awareness to the posture of the body. In the Satipatthana Sutta, the Buddha directs his monks to know when we are moving, know when we are standing, know when we are sitting, and know when we are lying down. Of course, there are many unique postures of the body other than these four. The body is often in movement, whether it is slight movement of the hands or the large movements of swimming. Again, the body is always with us. We are always able to bring awareness to the posture. A good practice with this is to bring awareness to the body every time the posture changes. For example, notice when you go from standing to sitting. How does it feel to rest the body in a chair? You may bring awareness to the body when you begin walking. What is present in the body as you are moving? This section of the First Foundation of Mindfulness may seem a little bit more abstract, but is in fact extremely pragmatic. The sutta directs us to practice clear comprehension when we are going forwards and backwards, looking straight on and looking away, in bending and stretching, in wearing clothes, in eating and drinking, in urinating and defecating, in walking and standing, in sitting, in sleeping, in waking, and in speaking. This may seem like a daunting list, but the direction to be understood here is to practice clear comprehension in all activities of the body. So what is clear comprehension? Clear comprehension is defined as comprehension of purpose, comprehension of suitability, comprehension of resort, and comprehension of reality. Comprehension of purpose is simply understanding whether our bodily actions have a skillful purpose. For example, why do we want to sit down? What is the purpose of going (walking) to this place or that place? We may consider this aspect of clear comprehension as checking in with our intentions. Comprehension of purpose encourages us to see clearly what the purpose of each bodily action is. This piece is fairly self-explanatory. Is this action of the body suitable for the present circumstances? Is it skillful to act this way right now? When we look at the suitability with clear comprehension, we are able to see if the bodily actions are cultivating awakening or more suffering. This factor of clear comprehension is sometimes translated as comprehension of non-delusion. This piece is about knowing the three marks of existence in the body (impermanence, non-self, and dukkha). We are to see how everything changes, see how it lacks an inherent, independent “self,” and that no experience of the body will ever lead to complete, lasting happiness. Sometimes referred to as “mindfulness of the repulsiveness of the body,” this piece of the puzzle is about looking at the true nature of the body. Rather than seeing the body as a whole, we break it down into its individual pieces. Traditionally, we practice by bringing attention to the thirty-two parts of the body3. This practice helps us to see the body in its reality. It can help us become disenchanted with the body, seeing it for what it truly is. As we break down the body in this fashion, we begin to see the three marks of existence present, especially non-self. This practice is to see the body as a changing process, and offers a different way in which to see the body. Traditionally, we look at the presence of wind, water, fire, and earth. These may also be translated as motility, cohesion, energy, and extension. Practicing with the four elements helps us to see the changing nature of the body, and provides a unique lens through which to investigate the nature of the body. Often referred to as “death meditation,” this practice can be heavy and emotional. Death is inevitable, yet we often have an intense aversion to the idea. Practicing with the cemetery contemplations helps us again see the reality of this body. Just like every body that has come before, it is subject to death and impermanence. Traditionally there are nine cemetery contemplations that offer a sequence of the decomposition of the body: the festering of the body, the body being eaten by animals, a skeleton with tendons and flesh and blood, a skeleton with tendons and no flesh and smeared with blood, a skeleton with tendons and neither flesh nor blood, a skeleton without tendons, loose bones bleached by the sun, year-old bones lying in a pile, and bones crumbling into the ground. This practice seems morbid, and is often difficult. However, it is an important practice to consider, as we it may helps us with the reflection of impermanence and the nature of the body. The Pali word vedanā is most often translated as “feeling tone.” With the Second Foundation of Mindfulness, we look at this feeling tone of experience. This is not a feeling like anger, anxiety, joy, etc. It isn’t an emotion. Rather, the feeling tone is simply pleasant, unpleasant, or neutral. For example, the experience of eating a slice of pizza may be pleasant. The experience of hearing a loud car may be unpleasant. The sensation of the feet resting on the floor may be neutral. Of course, these examples are not always true. Things are not inherently pleasant, unpleasant, or neutral. In practicing with vedanā, we are honest in that moment about the nature of experience. Something that was once pleasant may change and become unpleasant, or vice versa. The second piece of vedanā practice is to note whether the experience is bodily or mental. A pleasant bodily experience may be sitting down. A pleasant mental experience may be calmness or serenity. Finally, we are to note whether the experience is “worldly” or “unworldly.” Worldly experiences are anything related to the six sense-doors (hearing, smelling, tasting, touching, seeing, thinking). An unworldly experience is something not related to these sense-doors. For example, a worldly pleasant feeling tone may be the experience of seeing a sunset. An unworldly pleasant feeling tone may be the joy that arises from deep concentration in meditation. Practicing with feeling tones, or vedanā, is an important practice. Noticing the feeling tone of each experience, we are able to see it more clearly. As we develop the ability to tune into the vedanā of experience, we no longer identify so strongly with each experience. Unpleasantness often leads to aversion and pleasantness may lead to craving or clinging. When we know the feeling tone, we can begin to see this cycle and break it. Mindfulness of mental states is understanding when the mind is with lust, with hatred, with delusion, shrunken, distracted, developed, and surpassable. We also know when the mind is without lust, without delusion, etc. 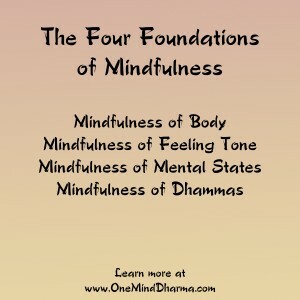 In practicing with this foundation, we essentially know the mood or tone of the mind. Is the mind angry or calm? Is it anxious or tense? We don’t necessarily look at individual thoughts. Rather, we look at the general mood of the mind. This foundation of mindfulness, of course, may be practiced individually (in and out of meditation). While sitting, we know when the mind is agitated or tense. In daily life, we know when the mind is concentrated or distracted. We may look at this foundation in relation to the first two as well. Something happens, it has a feeling tone, and the mind has a response. This may be an experience in the body or an experience with any of the other sense-doors. For example, we have a pain in the knee while meditating, find it unpleasant, and the mind becomes tense or irritated, falling into aversion. Or, somebody says something kind to us, we find it pleasant, and the mind is relaxed. Recognizing the mental state in our present-time experience allows us to see the connection between experience, feeling tone, and mental response. The Buddha listed clinging, aversion, and delusion as the main causes of suffering (the Three Poisons). With satipatthana practice, we see the process that causes suffering. We may also work backwards with this foundation. Maybe we notice the mind is agitated. We then realize that we just experienced something unpleasant. Bringing mindfulness to the mental state can bring awareness to the other foundations in this way. These five lists provide a way to look at how skillful or helpful the mental states are. As the third foundation helps us look at the arising of mental states as a result of vedanā, the fourth foundation helps us see how these mental states create or relieve suffering. Through the lens of these five lists, we practice observing how the mind is creating liberation or pain. We know when we are in aversion, when there is doubt, when we are experiencing suffering, when tranquility is present, etc. We are working on individual posts explaining these five lists in more detail, so please check the resources section below for updates! Understanding this teaching is important, but we cannot truly comprehend it without practicing it ourselves. It is wise to start by practicing with the First Foundation, bringing awareness to the body. We then can incorporate investigation of vedanā and practice this teaching sequentially. When practicing with the satipatthana, it is important to remember that our task is just to observe and keep these things in mind. This is why it is important to understand the meaning of the Pali word sati. The task here is to keep these foundations in mind. We don’t just observe blindly; we keep in mind the foundations while observing. Furthermore, we don’t need to change or fix anything. In mindfulness practice we are to observe, trusting that wisdom will abandon the clinging and aversion if we bring awareness to it. We can notice our judgements of right and wrong and let them be. Clinging to or averting from how things are just leads to more suffering. The instruction is to observe with equanimity and detachment. 1The Pali Canon is the collection of Buddhist teachings at the core of Theravadan Buddhism. The Pali Canon contains the oldest Buddhist teachings, and are believed to be the words of the Buddha. 3The thirty-two parts of the body are: hair of the head, hair of the body, nails, teeth, skin, flesh, sinews, bones, marrow, kidneys, heart, liver, membranes, spleen, lungs, bowels, intestines, gorge, dung, bile, phlegm, pus, blood, sweat, fat, tears, grease, snot, spittle, oil-of-the-joints, urine, and brain (which was added in the later commentaries).